I'm sure almost everyone has seen these little babies floating around Pinterest at least 10 times and I have always intended to try them, but for some reason it took me forever. I wasn't sure if I would like the heaviness of the mayo and poppyseed sauce, but I couldn't be more wrong. These sandwiches are amazing and totally worth the calories. They would be perfect for a big family gathering and would be a total crowd pleaser. 1. Spread mayonnaise onto both sides of the center of each roll. Place a slice of ham and slice of Swiss inside of each roll. Close rolls and place them into a 9x13-inch baking dish. Place very close together. 2. In a medium bowl, whisk together all of the poppy seed sauce ingredients. Pour evenly over all of the sandwiches. You may have extra sauce so use just enough to cover the tops. 3. Let sit 10 minutes or until butter sets slightly. Cover with foil and bake at 350 degrees F for 12-15 minutes or until cheese is melted. Uncover and cook for 2 additional minutes or until tops are slightly brown and crispy. Serve warm. 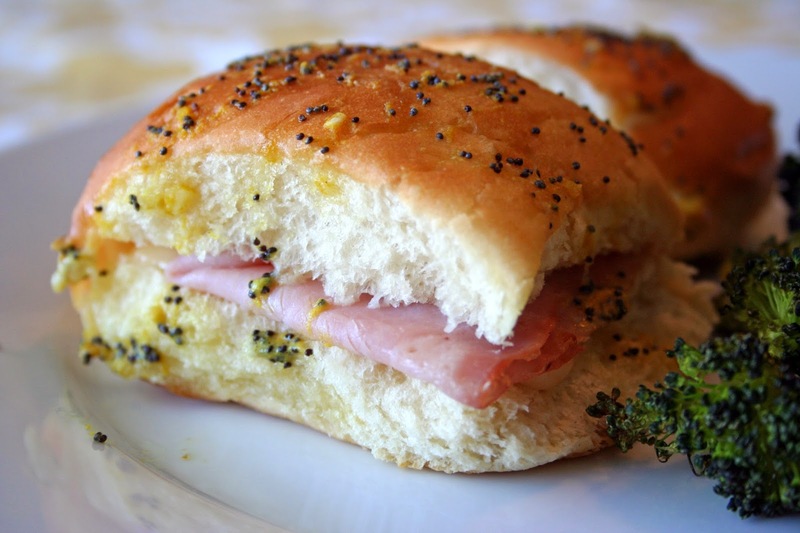 I love the classic ham and cheese sandwich combo, but your take with poppy seeds just blew me away. It looks so mouthwatering, I can't wait to whip up some of my own. Thanks for sharing that wonderful recipe of yours. All the best! The sauce really does make the sandwich! But what's better than a sandwich drizzled in butter, right?? Thanks for stopping by!